Now as you are no doubt aware Old Glory is a US based company founded around 1990 by Russ Dunaway and sculptor Dave Allsop and for the first year or so working out of Russ’s garage until the purpose built factory was finished. For many years all the many and various ranges – although largely designed in the UK were manufactured in the USA and while sculptors are now primarily US based- the production still takes place at the factory in Pennsylvania. However here in the UK we now make a small but growing number of ranges- some of which are exclusive to us here. This has come about through a variety of means. There are still ranges which are sculpted in the UK for Old Glory and the other US companies that I, here in the UK deal with but by a series of lucky chances and careful purchasing I now have several ranges which are primarily UK based and produced. Foremost of these is the “Lil’flyin’ Fokkers” range of 15mm (1/100th scale) aircraft models. At the time of writing the range has over 50 models and is still expanding. These are in scale with the Command Decision range of WW2 and Modern 15mm Vehicles and infantry which are also 1/100th. There is no scale confusion here. I know there are chaps out there who think 1/144th aircraft are the same as 1/100th scale tanks “cos they are up in the air” but trust me guys it simply ain’t so. 1 /144th go beautifully with the minifigs N (12mm) WW2 ranges but are too small for 15mm by about 20% or so. Numerous customers of the Command Decision range had pointed this out to me then a fella called Glen Brooks came along and said - “I have a few 15mm aircraft but I don’t really want to develop the range do you fancy it ...” Is the Pope a Catholic thought I!! So therefore gentle reader you can see why when I got the chance to develop a proper scale integrated range I took it. So far the range has mostly WW2 aircraft for all of the major combatants but there are also a few WW1 and 4 modern helicopters plus several modern aircraft including the Hawker Hunter and by the time you read this the Pucara. 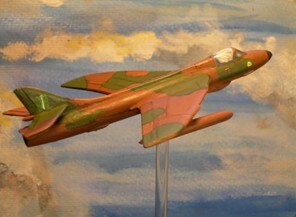 Future plans will include adding more WW2 aircraft and also some post war jet aircraft. Also in 15mm we have a slowly growing range of Vehicles and Figures echoing modern conflicts. So far there are 12 infantry packs, 3 crew packs and 12 vehicle packs plus -under the “Fireforce15 “ label some scenic items and a growing range of homegrown 15mm figures and vehicles for bushfire wars and newest of all 1980s British and Argentinians for the Falklands War. The Britis will also find themselves in BAOR for the sort of “Cold War gets Hot” scenarios that have become popular in recent years .To that end a range of 1980s Russians are in the Planning stage and more AFV are in the pipeline. So after a little negotiation the Pope once again averred his Catholicism and I acquired the rather splendid little range of figures and buildings. Since that time I’ve added another 10 or so packs and periodic expansion will continue. In 40mm there are several small lines. Most notably, Ancient Greeks and English Civil War/Thirty Years War under the Romanoff label. The 17th century stuff is compatible with the US based Sash and Saber ECW range and the superb figures for Drabant of Moscow and for my own use I’ve swapped parts and horse between all 3 ranges producing some individual figures which I’m quite chuffed about. I also have the ex Jacdaw 40mm TYW figures which will be integrated into the Romanoff range and add more command figures and Continental style infantry as well as cavalry and artillery to the range. 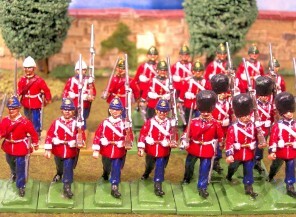 Also made in the UK are the 40mm Toy soldier style figures of “The Glorious Victorian Toy Soldier Company “ showing figures of the High Victorian era in the toy soldier style.